Christopher S. Rollyson has been a strategy, marketing and technology pioneer for over twenty-five years. He has led transformation from both sides of the desk: As a consultant and marketing executive, he has had a leading role in launching such game-changers as Java with Sun, ebusiness strategy with PwC Consulting, and SOA, Web services and architecture solutions with nVISIA and IBM. He has pioneered in experiential social media, a discipline that enables firms to create relationships that matter, quickly and inexpensively. 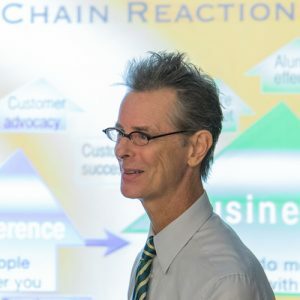 Mr. Rollyson currently leads CSRA, Inc., which works with commercial, government and nonprofit enterprises to use digital social technology for innovation. He has developed extensive intellectual property to help management adopt social business: the Chief Digital Office serves enterprise CEOs and Boards by making digital transformation profitable; The Social Channel App mobile app and book connects profound economic disruption and makes it actionable for firms and people; the Social Network Roadmap(SM) and the Executive’s Guide to Social Networks enable aggressive adoption of social business while mitigating risk. CSRA advises clients on transforming themselves to become more influential and profitable using social technologies to become more human and less mechanical. CSRA uses any combination of private social networks, platforms like LinkedIn, Facebook, Twitter and Google+, blogs, wikis, RSS, social bookmarking, YouTube and numerous others. CSRA blogs have often rated Top Ten, and Mr. Rollyson speaks globally at conferences with Global 100 executives. Formerly Vice President of Marketing & Alliances at nVISIA, he developed CIO engagement programs and the Enterprise Service-Oriented Architecture Roadmap to drive the value of software evolution through SOA, Web services and enterprise architecture, working with IBM, Rational and GrandCentral. Previously a subject matter expert for ebusiness and knowledge strategy at PricewaterhouseCoopers’ Strategy practice, Mr. Rollyson was instrumental in developing and bringing ebusiness thought leadership to clients in automotive, software, telecoms, consumer electronics, chemicals and petroleum industries. His focus was both on helping global enterprises to use ebusiness strategies to evolve themselves and on advising leaders of ebusiness start-ups to reinvent industries though innovation. One of the firm’s ebusiness pioneers, he helped build the firm’s Ebusiness Adoption Curve and several derivative models before being asked to lead development of the firm’s first services framework for ebusiness strategy consulting. He subsequently helped lead PwC’s venturing efforts by co-launching the B2B Accelerator, innovating alliances with startups, inventing a go to market model for strategic alliances and consulting to entrepreneurs on their business strategies. In addition, he played a key role in educating fellow strategy consultants on ebusiness and IT strategy. Outside the firm, he co-founded The KnockNow Foundation in Chicago, which formed networks between technology innovation start-ups and global enterprises. Prior to PwC, Mr. Rollyson led marketing at KPMG‘s Midwest High Technology practice, where he built one of the firm’s first intranets to transform the marketing organization to a real-time team. He directed marketing strategy for offices in twelve states, pioneered a new digital knowledge strategy and focused the delivery of consulting, audit and tax services to high technology clients. Previously at Strategic Technology Resources, a leading edge OOT and Java consultancy, he was pivotal in building the knowledge and marketing infrastructure to drive the firm’s expansion and played a key role in co-launching Java via marketing alliances with Sun and Netscape. Prior to that, he launched and built profitable marketing and human capital consulting businesses as an entrepreneur. Mr. Rollyson has done graduate work in corporate strategy and economics at The University of Chicago Booth School of Business. He is multilingual, having worked and lived in France, Italy, Germany, the UK, the Czech Republic and others. He took his undergraduate degree from Kalamazoo College. He may be found tearing up and down Chicago’s lakefront path, especially during extremes of sun, rain and people: unpredictable cyclists, children, dogs, bladers and walkers make speed+safety a game. I was glad to have run into you at the 1871 event this evening and to have had a chance to hear a bit about your work on trust. I will be happy to share other info that I have been pulling together about trust (and related issues), and I would be very interested in learning more about your work on those issues. In case you would find it handy, I am including my email and phone info here. Hi Bob, thanks for the link! I found the paper. My work focuses on building trust between people in the firm (employees) and people outside the firm (customers, partners, regulators, communities). I think that a large part of an org’s reputation is trust. But trust need not be an ethereal thing; it’s very contextual, i.e. can I trust a firm to have fair prices? Can I trust them to have the most innovative offers? Can I trust them to work with me to address miscommunication that interferes with my ability to get value from their product/service? Experiential (what I do) interacts with individual people, we treat people personally, by listening to them and trying to help them do what they want to do. Most firms put themselves first, and customers second, and customers feel that. Many firms can build stronger businesses by truly putting customers first, but most do not—they only say they do. If this sounds interesting, here’s experiential’s home page. I’d love to learn more about the stuff you’re pulling together on trust!